As I navigate Austin’s food scene, I’ve started compiling a list of essential Austin restaurants to better entertain any future visitors I may have. I’m starting this list with Elizabeth Street because, quite frankly, I fell in love with the place before I even tried the food. To me, its South First Street facade looked quintessetially Austin before I even knew what “quintessentially Austin” means or will ever mean. It is an adorable restaurant. And when I say adorable, I mean super stinking cute: the frames of the window panes are painted a bright, friendly blue and the patio is sprinkled with sturdy bistro tables and blue-cushioned chairs. Giant live oaks offer natural shade to the many outside diners. The servers are all, somehow, beautiful; the inside decor is clean and bright. Elizabeth Street specializes in Vietnamese cuisine, but they also happen to be a boulangerie, something that this little francophile can’t resist. While working at Seventh Flag Coffee across the street, I decided to take a writing break and test the waters with one of my favorite foods on the planet: the almond croissant. 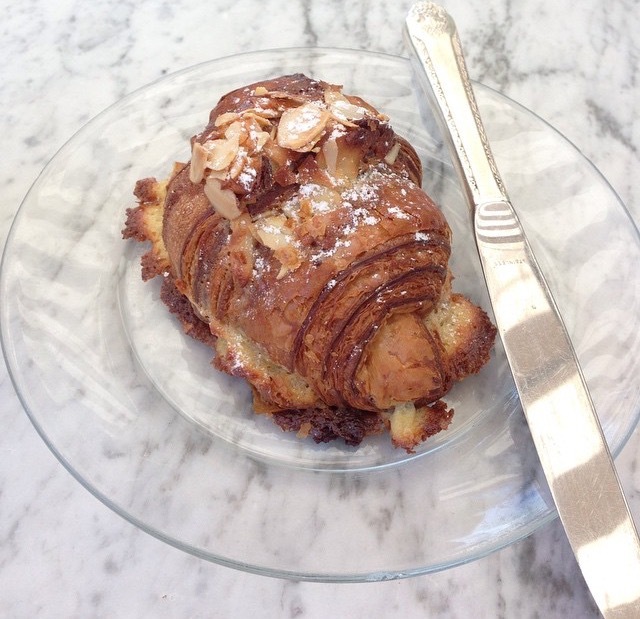 Almond croissants should be made differently than regular croissants, or even chocolate ones. They are in a league of their own. With each bite, you want a flaky crust followed by a smooth, almost-creamy center. It should be sticky, messy and sweet. It shouldn’t be on your plate for long. Elizabeth Street’s almond croissant is all of these things. And for a price that would shock even the least frugal of Parisians ($4.50), I get to have it just about anytime I want. Leave the boulangerie alone and Elizabeth Street is still delightful. Weeks after my almond croissant-gasm, I shared a table on the shaded patio with two pretty friends and three gorgeous Bahn Mi sandwiches. 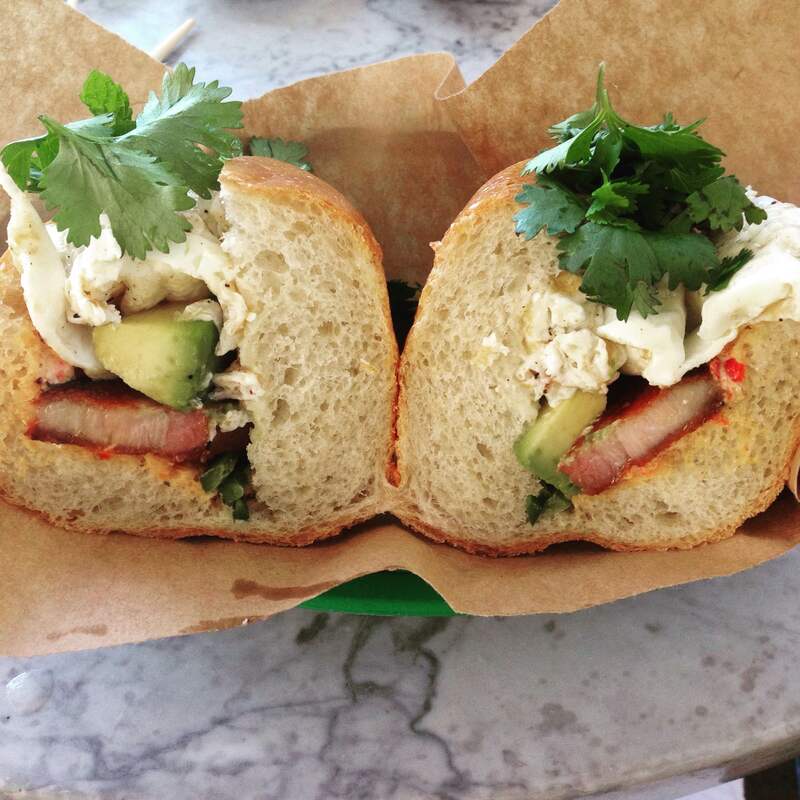 I’ve written about the Bahn Mi before. The sandwich would be lost without good bread, of which Elizabeth Street has no shortage. The restaurant offers a wide range of options, from korean-inspired BBQ with kimchee to traditional chicken or pork, but I opted for the pork belly. I always opt for the pork belly. Elizabeth Street’s pork belly Bahn Mi ($10) is made complete with a little avocado, a little cilantro, a little mint, a little mayo, and a delightfully runny fried egg. The sandwich comes out just hot enough to sink your teeth in right away, causing the fried egg to burst open and cover the bread in warm yolky goodness. their pork belly is less fatty than those I’ve had in the past, but still packs in a lot of flavor. The herbs are always my favorite part, and I firmly appreciated the restaurant’s liberal use of cilantro on my sandwich. A touch of sriracha and hoisin adds a nice edge, but it’s hardly necessary. The sandwich is complete on its own. 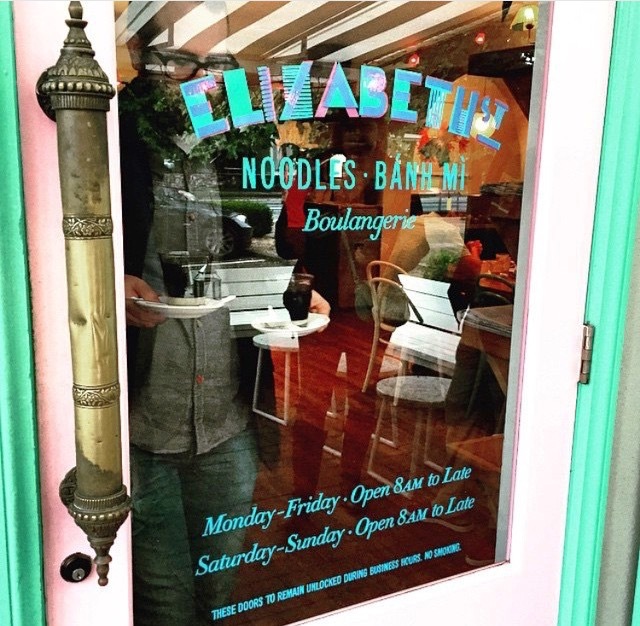 Elizabeth Street’s menu is seeping with things I absolutely must (and will) try. It’s pricier than I’d like it to be, but I have no doubt in my mind that I will be back, poor as dirt or not.